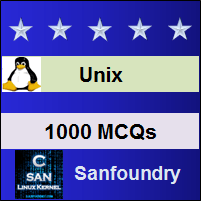 This set of Unix Multiple Choice Questions & Answers (MCQs) focuses on “Counting File Data: wc Command”. 1. Which command is used for counting words, lines and characters in a file? Explanation: UNIX provides a universal word counting program that allows us to count the number of words, lines and characters in a file. It takes a filename as an argument as produces a 4 column output. Above output indicates that file01 contains 3 lines, 9 words and 45 characters. 2. wc command cannot take multiple filenames as arguments. 3. Which option is used for counting the number of lines in a file only. Explanation: -l option when used with wc command display only the number of lines in the specified file. 4. Which option is used for counting the number of words in a file only? Explanation: -w option when used with wc command display only the number of words in the specified file. 5. Which option is used for counting the number of characters in a file only. Explanation: -c option when used with wc command display only the number of characters in the specified file. 6. wc command can also work on a data stream. 7. What does the following command do? Explanation: > symbol can be used with wc command for redirecting output. For example, the following command will read the input from sample.txt and redirect its output to newfile. 8. Which command is used for printing a file? lp command notifies the request-id i.e. a combination of printer name(rpl) and job number (890). 9. Which option is used with lp command if there are more than one printers in the system? 10. Which option is used for printing multiple copies of a file using lp command? 11. -t option prints the title on the first page. 12. What does the following command do? Explanation: cancel command is used to cancel the jobs submitted by the user for printing. cancel command can cancel the job only when it is in print queue i.e. waiting to be assigned to a printer. If the printer has already started processing the job, cancel command will not work. 13. Which command is used for knowing the file type? Explanation: UNIX provides the file command for determining the type of file i.e. whether it is a text file, script file, archive file or any other type of file. 14. file command identifies the file type by examining the magic number of the file. Explanation: Magic number is the number which is embedded in the first few bytes of a file. Every file has a unique magic number which helps in identifying the file type. Explanation: The man command displays its output one page at a time. This is possible because it sends its output to a pager program. more pager is extensively used in UNIX system and it has replaced the original pager of UNIX i.e. pg. The task of a pager program is to simply display pages on the terminal. It can also be used to display the contents of a file. $ more  abd.txt   // contents of the file named abd.txt will be displayed. 16. Which of the following is not an internal command for more? Explanation: more pager offers a set of internal commands which are used for viewing pages differently. For scrolling one page at a time, use ‘f’ or the space bar. Similarly for scrolling backward press ‘b’ and for quitting the pager use ‘q’.